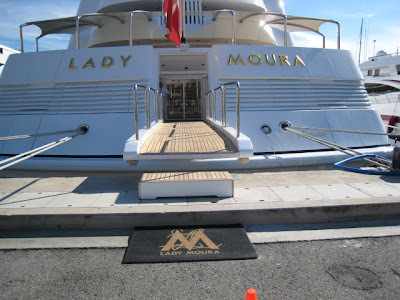 The 'Lady Moura' is the largest yacht in Monte Carlo and apparently in the world. 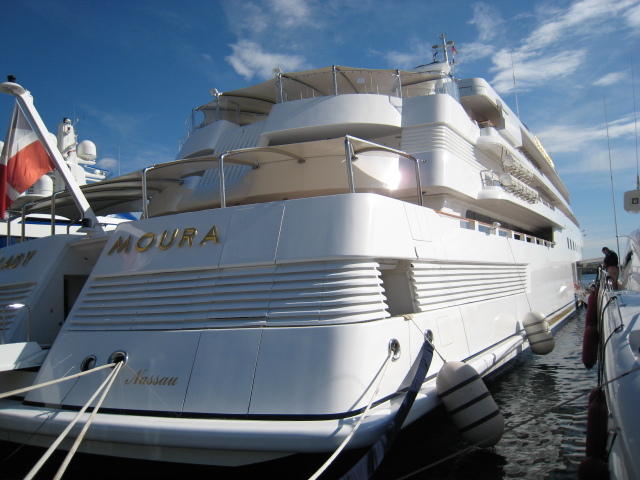 Built in 1990 at a cost of $100 million, which makes her reputedly the most expensive private yacht in the world, she is owned by a Saudi business man, Nasser al Rashid. She carries a crew of 60, and incorporates features such as a beach resort complete with sand, a large pool with a retractable roof, and a 75ft dining table custom-made by Viscount Linley. She has an onboard helicopter and you can see more photos of her here. Wow! That's some vessel! I can't even imagine it. My bags are packed...now if we could just have this yacht for ourselves minus the sheik, I'd be happy.